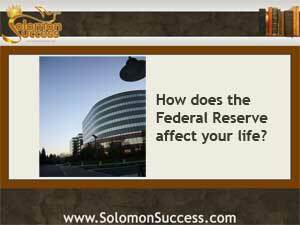 Solomon Success > Blog > What Does the Fed Mean to You? King Solomon’s proverbs show us a monarch concerned with wisdom and prudence, who recognized that the decisions made by a ruler have the potential to affect everyone in the realm in some way. In today’s financial world, the Federal Reserve has the power to make monetary decisions that can touch nearly every aspect of daily life –even though many people don’t know it exists. That’s why the bond buy up effort has continued to make news. Faced with a struggling economy that’s taking too long to rebound after the housing crash and the recession that followed, the Fed instituted a massive, not just large, scale effort to buy up trillions of mortgage-backed securities. The buyup put money back into the banking system, which in turn pushed interest rates low.